We've just completed work on the design of a new website for Looby Plant & Agricultural Services, Ballymote, Co. Sligo. We worked closely with Noel Looby, proprietor of Looby Plant & Agricultural Services to achieve the look and feel he wanted from a website. Noel wanted a platform where he could advertise the services his company offers as well as showcasing some of the work they have carried out throughout the country. We sat down with Noel and went through his ideas for what he wanted to achieve with the website and planned what type of website and what pages were needed to best showcase the services offered by the company. It became apparent early on that Noel needed a website where he could upload his own photos and content so we suggested he might be best served with a WordPress website. This would afford him the opportunity to make changes to his website with the minimum of fuss. We set about creating a custom WordPress theme for Noel that would incorporate his logo and colour scheme as well as make the best of the large number of photographs that Noel had of some of the work his company has carried out. As well as building a gallery into the design, we also included and image changer on the home page that would flick through some of the machinery for hire along with a small selection of some of the jobs undertaken by Noel and his staff. 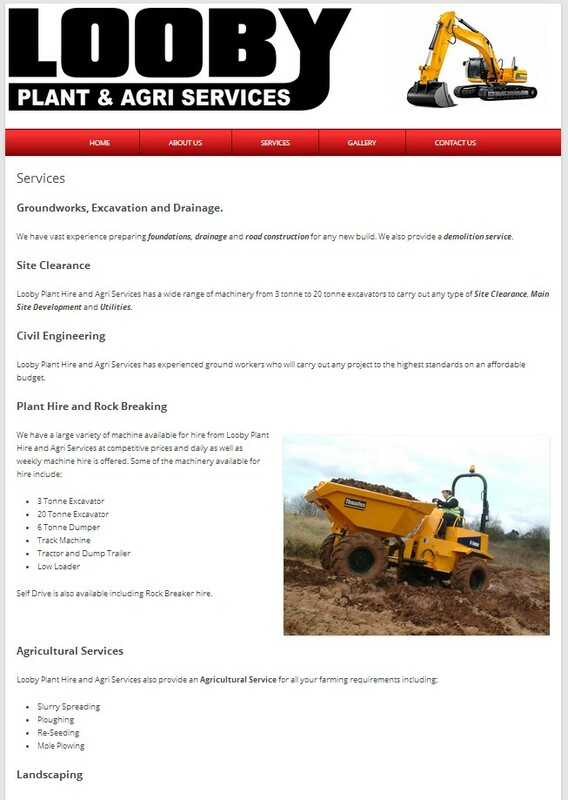 Looby Plant & Agricultural Services website also incorporates Facebook Open Graph and Google Analytics into its list of features. We would like to take this opportunity to thank Noel for choosing Sligo Web Solutions and wish him every sucess with his new website.